Those murderous marionettes are back to deliver slashings of bonkers gore and bad taste humour. Recently divorced and reeling, Edgar returns to his childhood home to regroup. 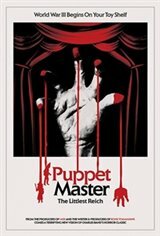 Finding a nefarious-looking puppet in his deceased brother's room, he decides to sell the doll for quick cash at a small-town convention celebrating the 30th Anniversary of the infamous Andre Toulon murders. Girl-next-door Ashley and his comic book shop boss, Markowitz, join Edgar for the doomed road trip; where all hell breaks loose, a strange force animates other puppets at the convention and a bloody killing spree begins motivated by ancient evil.